Latin supergroup Las 3 Divas has announced a tour schedule to entertain troops overseas. Sponsored by musical giant Gibson/Epiphone Guitars and Armed Forces Entertainment, the 21 day tour will launch Sept. 30, 2005 and conclude on Oct. 16, 2005. Regularly surveying across the world troops to ascertain their entertainment tastes, Armed Forces Entertainment receives the same request year after year: Latin, Latin and more Latin. Las 3 Divas, a vibrant Latin group bringing together the seasoned musical talents of Shelly Lares, Elida Reyna and Stephani Montiel, have answered the call to bring this entertainment to U.S. military personnel serving overseas. 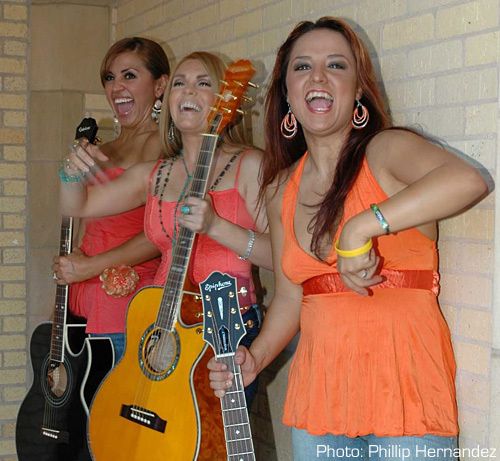 Maintaining demanding solo careers prior to the formation of Las 3 Divas, the artists were asked to perform a tribute piece together in honor of the late Latin powerhouse, Laura Canales at the Tejano National Convention in August of this year. The performance received such acclaim that the solo vocalists decided it was time to officially join forces and record an album together. Las 3 Divas released their first self-titled album in September 2005, and features both single and trio performances by the artists. The first single from their album “La Cumbia Del Oeste” has already hit number one on Texas Latin radio stations. Las 3 Divas will begin their whirlwind tour on Tuesday, September 27 and return home on Monday, October 17. The group will travel with an 11-piece ensemble. The 21-day tour through the Pacific Rim will include Commander Naval Forces Marianas, Guam (Sept. 30); Anderson Air Force Base, (Oct. 1) Yokosuka Naval Base (Oct. 4); Misawa (Oct. 6); Yongson Garrison, (Oct. 8); Kunsan Air Base, (Oct. 9); Camp Casey, Korea (Oct. 11); Camp Humphries, Korea (Oct. 12); Camp Red Cloud, Korea (Oct. 13); and Camp Foster, Korea, (Oct. 15-16). Las 3 Divas will also visit several other remote locations as well as Navy ships during the trip. 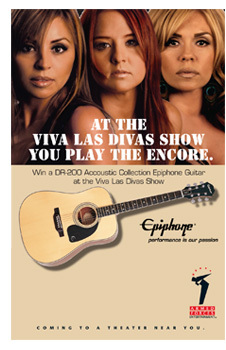 As an added bonus, the Divas will be giving away an Epiphone DR-200 acoustic guitar at each show! Epiphone's Don Mitchell talked with Stefani, Elida and Shelly on September 26th, the day before they left on their Armed Forces Entertainment tour. EPI: Tell me how you each got started in music. SHELLY: Most of my family is musically inclined. My dad was playing music before I was born so music has been a big part of my life from the start… and really from both sides of my family. None of them were crazy enough to take it on as a profession though! I started performing pop music when I was young. I did a lot of Linda Rhonstadt, Olivia Newton John, everything from country to rock. Initially, Tejano music was just something I did at home, weddings or parties but I’ve now been performing Tejano music for twenty-three years. STEFANI: My family was also musically inclined so I grew up around music. I started singing with my dad’s band when I was three and recorded my first album when I was five. It’s been great journey since. ELIDA: I began performing in talent shows when I was eight and by the time I was nine, I knew I was going to be a singer. Through my high school years I was in several local groups and then when I entered college I met my band Avante which I was with for eight years. We were signed to a label and the rest has been history. EPI: You all three obviously had successful solo careers. What was the inspiration to join forces and work as a group? Las 3 Divas: (left to right) Stefani Montiel, Elida Reyna and Shelly Lares. SHELLY: I was doing a show with Stefani a while back and it was actually her dad Dwight that suggested it would be cool if the three of us could collaborate on a project. It was something the men in our genre had done before but never had three women done a collaborative project. We tried it and It just worked really well. STEFANI: It’s exciting to be the first girls to attempt this! EPI: Do you find it hard to maintain your solo careers with the Divas being so popular and time consuming? STEFANI: It is a lot of work to try and do both but I think it has only bettered our solo careers. ELIDA: Yes, and I really think the Divas is unique in that we are a group and yet we are able to maintain our individual personalities on stage. It really works well. EPI: How has all of this impacted your family life? STEFANI: Well, I have two kids… my daughter is nine and my son is six. I love them to death and they are my life so I have been crying all day knowing I will leave them in the morning! (Laughter) They are wonderful though, they understand what we’re doing and they’re every excited about it. They’ve gone to school and told all their friends and teachers that we’re going overseas to play for the troops and everyone is very supportive. SHELLY: I’m not married and I don’t have kids… I do have a dog! Stefani and Elida are great examples of how I want to be when I have kids. Maintaining a career and having children at the same time is not easy and I have two good examples in front of me. ELIDA: I have been married for seven years and I have a five year old daughter and a son who will soon be four. SHELLY: And you know Don, its tough. If you look at other genres like country for example, they usually have the ability to take their children with them but in our industry traveling is really hard so it’s not so feasible. It’s just amazing for them to be able to say goodbye to the kids and be away from them. And they are such good kids… actually I’ve adopted them all so I guess I really have four kids! (left to right) Elida, Stefani and Shelly with their Epiphones. EPI: Tell me how the Armed Forces Entertainment tour came about. STEFANI: The Pentagon was interested in focusing on entertainment for the Latino soldiers which they had never done before. It’s was not an easy task for them because they had to find the right person or group and not just a group that plays Spanish music. That wouldn’t work. They needed a group that did a little bit of everything and the Divas fit that mold. It’s taken a full year to finally get all of this together and we’re honored that out of about 100 different groups, they chose us to go! SHELLY: We’re really excited and a little nervous too. It’s part of the world that we’ve never been to before. We’ve traveled the United States and Mexico but never to the other side of the world and never for that many days but we’re really looking forward to it. We’re just really happy that we’re going to have the ability entertain our troops. We’re really excited about the opportunity itself. STEFANI: We had a special church mass the other day and we got a standing ovation from the people. You just see the appreciation, especially from the people that have family in the service. They understand what it means to them. EPI: And I understand you guys are filming and there could be a behind the scenes DVD when you get back. ELIDA: Yes, you can definitely look for that. It will be neat for our fans to see what goes on behind the scenes. EPI: So where do you see yourselves in six months? SHELLY: I think we’ll be doing the same thing. The Divas is really just getting started. We’ve not even had a chance to go on the road and promote the CD yet so I think we will be doing that. STEFANI: I don’t think it’s even close to reaching its full potential yet. People are just starting to kind of hear about the Divas. EPI: I appreciate you guys chatting today. I know you are leaving the country tomorrow morning. 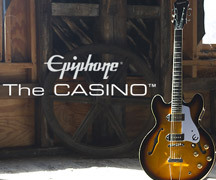 And by the way, thanks so much for choosing Epiphone instruments to play! STEFANI: It’s our pleasure. Shelly is the “real” guitar player in the group (laughter) but I am learning fast. It has been so fun. The only thing I haven’t liked is the blisters I’m getting on my fingers… and having to cut my nails! I used to have these nice, long, pretty nails and now I’m like, I can’t play with these nails…off they go! 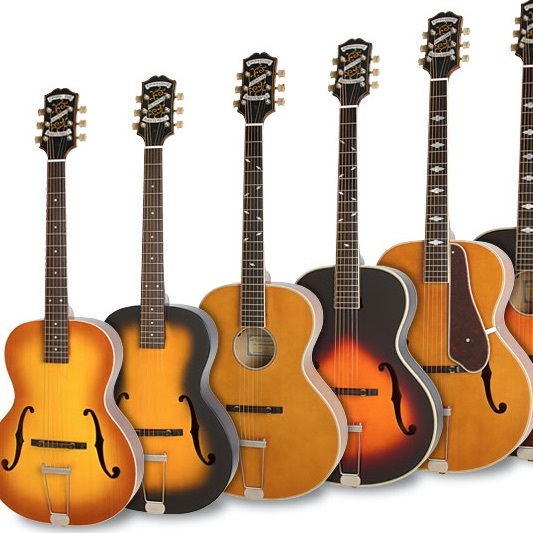 SHELLY: I’ve been playing since I was in my fourth grade choir and I love my Epiphones. Seeing the girls with the guitars now is so cool. It’s a whole new persona you take on when you put those Epiphones on! ELIDA: Yeah, then you get to ROCK! EPI: Thanks girls and we look forward to seeing some pictures from your overseas tour! For more information about Las 3 Divas visit www.Las3Divas.us. Armed Forces Entertainment is a military command operation that through the military and its various branches provides entertainment to U.S. troops stationed overseas with priority given to those in contingency operations and remote and isolated locations. Founded in 1951 Armed Forces Entertainment brings a touch of home to more than 500,000 troops annually, embracing the best of Americana that stretches across all genres of entertainment. Armed Forces Entertainment offers entertainers the opportunity to reach an appreciative audience, and fulfill their civic duty to America’s finest and bravest as they serve their country across the globe. For additional information please visit www.armedforcesentertainment.com.